﻿﻿Grace Baptist Bible College is distinctively local church oriented. We are very thankful for the pastors and churches that support and sponsor GBBC. It is our privilege to provide opportunities for fellowship, enrichment, information, and discussion about current issues that are affecting pastors and local churches. These events are not only for pastors. Deacons, sunday school teachers and other Christian workers are welcome as well. Come join us for the next pastors roundtable! 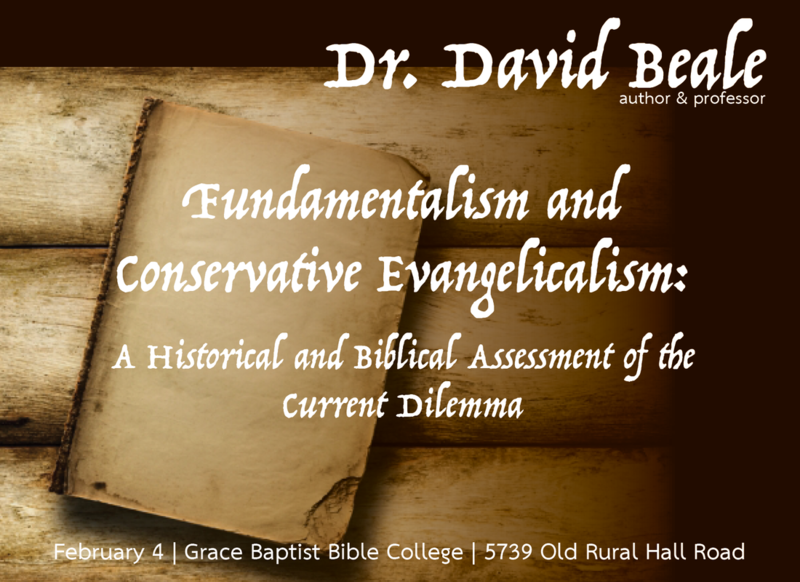 Join us on Monday, February 4, as respected author, professor, and church historian Dr. David Beale presents "Fundamentalism and Conservative Evangelicalism: A Historical and Biblical Assessment of the Current Dilemma." Dr. Beale will also have a book table, and we will take up a love offering for him. ​Registration will be from 9:00-9:30 AM and is $5. Lunch will follow the sessions. RSVP through the form on this page, or by emailing us at ddmelton@gbbcnc.org.